Meet the Power Puffs, a four power-packed all-female group comprising Sarah Yepthomi, Kumgha Awomi, Joanna Jamang and Hanshi Yimchunger. 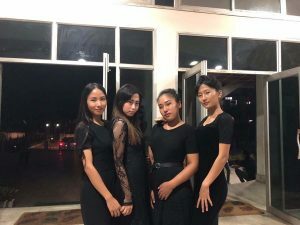 Formed in early 2018, these girls want people to appreciate their music. Their hope is to inspire people through their music. Read on to know more about the Power Puffs and their musical aspirations. EASTERN MIRROR: How did the four of you come together? Power Puffs: We all met through our mutual friends and we kind of discovered one another and introduced each other to one another. Kumgha and Joanna had been friends since higher secondary and Sarah and Hanshi had known each other for quite some time. EASTERN MIRROR: What’s with the name of your group “Power Puffs”? Power Puffs: When we first thought of the name, even we were very unsure because it seemed kinda childish but now we feel like it suits us very much. The four of us are still very new to the world, we’re still babies facing this big world but we are always there to energise one another. So power puffs, kinda childish but strong also. EASTERN MIRROR: How would you describe your music to people who have not heard you before? What does your act consist of? Power Puffs: To people who haven’t heard our music we’d say our music is fun and we hope everyone has a good time when they’re listening to us. EASTERN MIRROR: Do you think that being an all-female band makes it harder to demonstrate it’s all about serious and skilled music. Power Puffs: We’ve never had to face such problems till date so we can’t really comment on that. The people around us are always very supportive and understanding. We’re very thankful to have so many loving and supportive people around us. 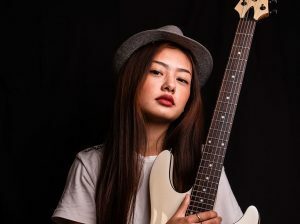 EASTERN MIRROR: Is there any all-female band that you look up to and any of them you’d like to share the stage with? Power Puffs: Our group member, Sarah, introduced us to Little Mix and we’ve all fallen in love with their voices. It would be such a privilege if we ever got so lucky that we get a chance to share a stage with them. EASTERN MIRROR: Do the four of you share the same music taste? If not, how do you work out the differences? Power Puffs: Definitely not. We definitely do not share the same music taste. We all have our own style and this has helped us a lot. We’ve learned a lot about so many kinds of music. This has been so beneficial for us so far. EASTERN MIRROR: Do you write your own songs? If so, how does the song writing works for you? Power Puffs: So far, no, but we’re looking forward to writing and conveying messages through our songs. We hope we’ll be successful in doing so. EASTERN MIRROR: Three issues that you feel strongly about the state music industry. There are not many opportunities for casing talents. The Artists get chances to showcase their talents only during shows. 2 It would be reassuring to see raw talents be it, comedy, drama, music, of all kinds, in all spheres is recognised and discovered. Also, Lack of awareness that the music industry is an actual profession. Many talents go wasted because they are too afraid to take the risk of indulging themselves in a field where your success, no matter how good you are is not guaranteed. So you have to be able to take risks to survive in the industry and many people don’t have that. EASTERN MIRROR: Which are the targets of “Power Puffs”, the goals that you have as a band? Power Puffs: As a band we hope we will grow bigger and better in time. Our main goal is to be an inspiration to many young and old souls.